Q: I bought my iPod touch 5 few months ago. It had been running really smoothly during the first 3-5 months, but now it becomes ever more slowly for the daily entertainment. I have tried to find out the reasons on the Internet and many people said that is mainly because too many apps on my iPod touch. But actually, I only got 3 pages worth apps on my iPod and they are all saved in folders. I don't understand why my iPod is slowing down day after day. So is there a way to boost it up? Or is it any tool can clean my iPod memory and speed up the device soon? I really need an effective solution to assist me, thanks in advance! If you're a novice for iDevice or smart devices in the daily life, then you may don't know that there are lots of caches, temp files or junk files have been generated while you're playing music, movies, games, etc. on the device. And in most situations, these files will not disappear even though you have closed the apps on the device. Thus, more and more storage space have been occupied by these cache files, and your iPod becomes slowly and slowly. After understanding why your iPod slow down, the problem here is how to clean iPod memory and speed up it. 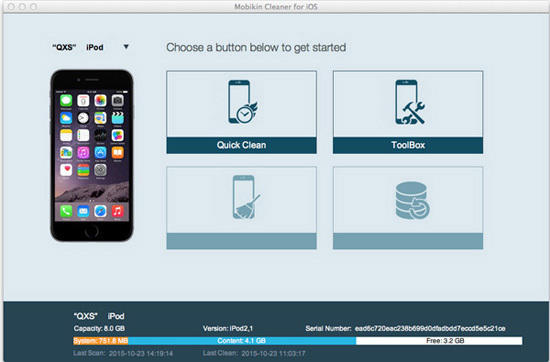 To solve the problem, here we could like to strongly recommend a powerful data clean software for your iPod touch, iPod classic or iPod nano - MobiKin iOS Data Cleaner (Windows/Mac). 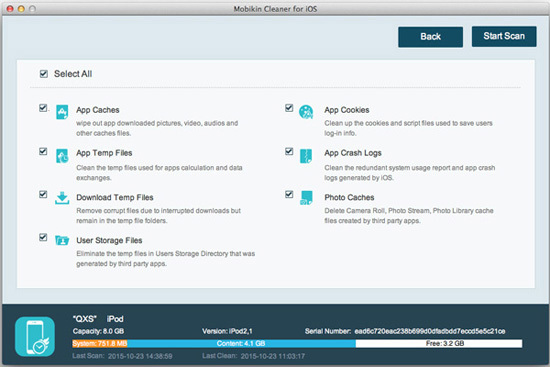 With it, you can clear, delete or erase the data like caches, logs, temp files, junk files, etc. on iPod, iPhone or iPad with one simple click. And it also allows users to wipe files like text messages, contacts, notes, calendar, or more specific data on the iDevice without restrictions. Cool, right? Now, just get the free trial version of the powerful iPod Memory Cleaner and let's to see how easy the program works by following below instructions. How to Clear or Clean iPod Memory on PC or Mac OS X? From the above interface, you may have known that you'll be required to select a mode after launching the program and connecting your iPod to PC. If this is the first time for you to use the program, we could like to recommend you to choose "Deep Scan" to conduct a deep scanning on your linked iPod, so that you can get all unnecessary files on your device. Tips: In order to avoid losing important iPod data by accident, you'd better to backup the whole iPod data to other security places with some 3rd-party program. If you wish to backup them to your Windows or Mac computer, you can take a trial on this MobiKin Assistant for iOS (Free). Hit "Scan" button to begin the scanning for files, and here you can view the found files and data in the program during the process. When the scan is finished, you can tick all found data or specific data you like to wipe, then click "Clean" button to delete them at once. When you quit one app and enter another, remember that the quitted app is still running on the background. Too many background apps will surely slow down your iPod device. Just follow the below steps to speed up iPod to the best. - Tap on Home button on iPod twice to open the multitasking screen. - Simply swipe the apps thumbnails upwards to close the app that you don't need. Once the auto-updates feature is enabled, your apps will be automatically updated to the newest version whenever it is available. Since app size usually varies from MBs to GBs, its updates in the background surely will occupy much RAM and slow the operation of your device. Therefore, you have every valid reasons to turn off auto-updates at regular times. iMessage has a lot of new features such as upgraded stickers and emojis, which surely occupy much more space and speed up the device. So you can go to Settings > Messages > Low Quality Image Mode. Then turn it on. Sometimes, even if you didn't run certain apps on your iPod, certain apps will run by themselvers, among which some are essential for the running of your iPod, but some are not. To speed up your iPod to the best, you need to stop these unnessary services such as App Store and iTunes. - Go to Settings from iPhone Home screen. - Select "iTunes and App Store" option to continue the process. - Then turn off the options of “Music”, “Apps” and “Updates”.